Tag Archive | "Spotted Hatchetfish (Gasteropelecus maculatus)"
The Spotted Hatchetfish (Gasteropelecus maculatus) is found on the Pacific slopes of Panama, and in the Pacific and Atlantic drainages of Colombia, to the Maracaibo basin of Venezuela. The Spotted Hatchetfish (Gasteropelecus maculatus) is one of three known species of the genus Gasteropelecus. The other two species which are also often kept in an aquarium environment are Gasteropelecus sternicla and Gasteropelecus levis. Like all hatchetfish, the Spotted Hatchetfish has a keeled body shape and an enlarged, highly developed pectoral fin musculature attached to the sternum that resembles the head of a hatchet, hence it’s common name. The ventral fins are very small and the back is fairly straight. 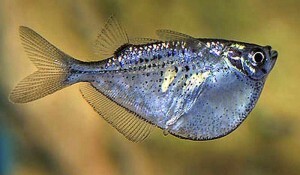 Their wing like pectoral fins are transparent and often measure up to one half of the overall body length of the fish. Their overall body color is silver with an olive brown back and small black spots that cover mostly the mid sections and upper body of the fish. During spawning season, the females are uaully plumper in appearance. Tropical fish keeping enthusiasts commonly categorize all Gasteropelecids as “freshwater hatchetfishes” which sometimes makes proper identification a challenge. Like most Gasteropelecids, the Spotted Hatchetfish is a shy, peaceful, and somewhat nervous shoaling species that spend most of their time close to or just under the surface of the water where they feed primarily on terrestrial insects, mosquito larvae, worms, and small crustaceans. All freshwater hatchetfish are known for their ability to leap from the water and glide several yards to escape predation and catch flying insects close to the surface. Spotted Hatchetfish should be housed with at least 6 or more of their own species in an aquarium with a lot of water surface area. Because of their skittishness, they should be kept in a densely planted tank with some floating plants , a moderate amount of current and a tightly fitting top. An Amazon setup with some driftwood , leaf litter and a sandy substrate suits this fish well. When housed in a community tank, they do well with other peaceful species lik tetras, smaller plecos, Corydoras and the smaller bottom dwelling cichlids. In the wild, Spotted Hatchetfish eat insects as their main diet. 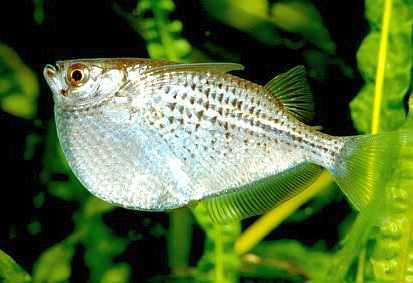 In an aquarium environment, they sometimes balk at eating dried floating flakes but over time they will usually accept them as well as floating micro pellets. They should be offered a varied diet that also includes Drosophila fruit flies , daphnia , mosquito larvae, and frozen or freeze dried bloodworms. Several small portions should be fed over the course of a day. 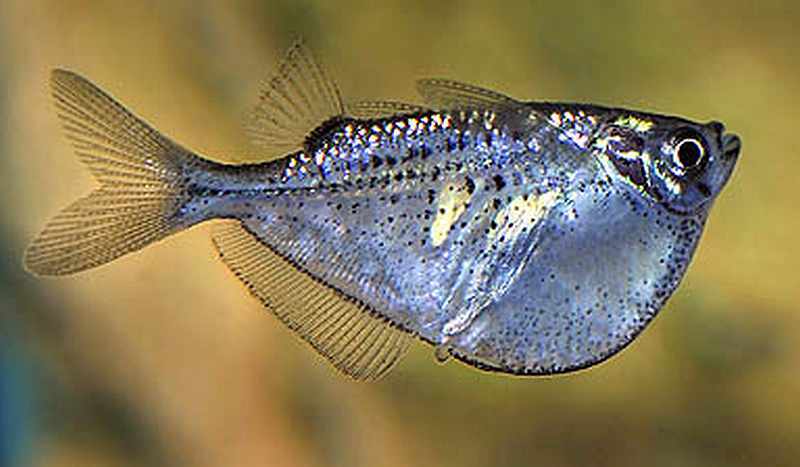 Spotted Hatchetfish are readily available in most tropical fish keeping shops at a size of 3/4″-1″ in length.